The Connecticut Restaurant Association is hosting restaurant owners, operators and managers to attend one of its Regional Legislative Roundtables to discuss industry issues including $15 minimum wage, tip-credit, paid family leave, on-call scheduling, soda tax and more. Space is limited. To register​ for an upcoming event, please click an option below. Each event is free for all CRA members and non-members. 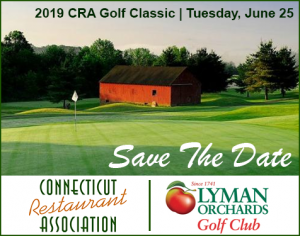 The Connecticut Restaurant Association will host its Annual Golf Classic at Lyman Orchards Golf Club on June 25, 2019. The day will kick offs am with registration, lunch and time to mingle with fellow CRA Members. Golf begins with a Shotgun Start, Scramble Format. After eighteen holes of golf, there will be cocktails, dinner and awards. More details coming. The event supports the Connecticut Hospitality Educational Foundation and the CRA. Visit ctrestaurant.org for more information and sponsorship opportunities. See last year’s highlight’s here.